This is the second book in a new series by popular author, Kim Harrison. Though I haven’t reviewed it here, I did do a speed read of the first book, The Drafter, so that I hopefully wouldn’t get caught off-guard in this second book. But I’m not sure it mattered too much. A ‘drafter’ is someone with the ability to go back in time, just by a few seconds or so, to correct a mistake or change a moment (such as ‘how would you react if someone was shooting at you’). But a drafter can’t remember what has been changed and so a drafter (at least one who has been recruited to a special agency) has a partner who is rooted in the timeline and can report on what has been changed. Great. Fascinating concept. Not too unlike Wesley Chu’s Time Siege. In the first book, our heroine, Peri Reed, discovers that her partner has actually betrayed her and reported her as a corrupt agent and so she has no choice but to go on the run. Now, in The Operator, Reed is still on the run but she learns of a drug that might help her with her memory and eliminate the need for someone to be her anchor. But as with most drugs, there are side-effects. Is it worth it? In her need to avoid the authorities and to interact with criminals (to procure the drug) Peri gets caught up in a web of traps and releases and is never sure who she can trust. Even her own memory is faulty enough that she can’t rely on what she thinks she knows to be true. Unfortunately, this series so far hasn’t been able to grab my interest. The idea is really fun and I like books that make my head swim with trying to follow time streams, so I thought that this would be right up my alley. But I also like books with characters who take me along for the ride; characters I can like for one reason or another; characters who help the plot seem reasonable and that’s where this book falls short. There’s nothing I like about Peri Reed. It’s not that I dislike her, I just haven’t gotten to find anything about her that’s worth making me want to know more about her or care about what happens to her. The rest of the characters around her are as equally bland, making this a dull read with an interesting premise. I have one more book (or novella) in this series in my ARC queue that I will read, but unless that really is remarkable, I won’t be reading any more of this series. Looking for a good book? 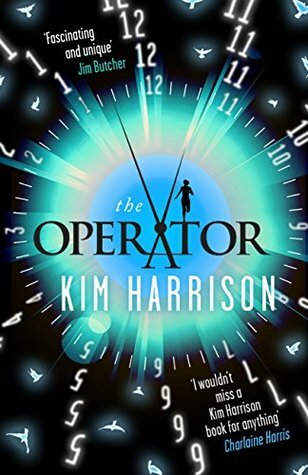 The Operator, by Kim Harrison, has a thrilling sci-fi premise but is inhabited by characters that really aren’t worth reading about.